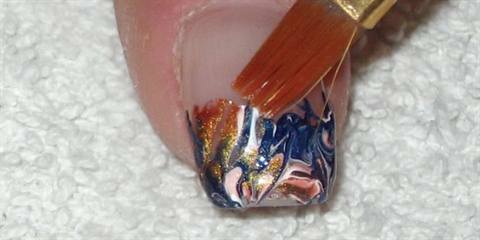 I love the effect achieved by water marbling, but I don’t care for the fuss or the mess,” says nail tech Victoria Hunter, the owner of Ongles Chez Victoria in Chateaguay, Quebec. So Hunter devised her own technique — called the free-hand marbled French — to achieve the same look. “It’s very simple, but gaining popularity among my clients who like the classic French, but are bored with it,” she says. Hunter created an online tutorial outlining her marbling technique — an abbreviated version of which you can read below— and has even posted a video demo on YouTube.com. 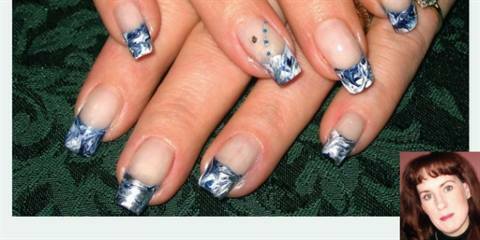 She notes that the design can cover the entire nail surface or just the free edge. 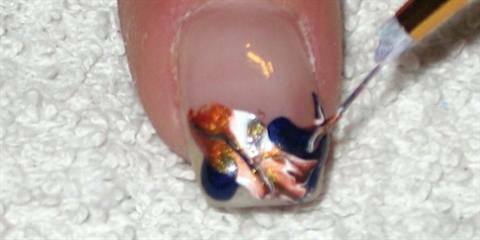 Techs can use nail polish, acrylic paints, or even UV gel polish for the same results. You can find the full video on YouTube.com at www.youtube.com/watch?v=-LP2gthyj0A. • Choose two to three shades of nail polish, UV gel polish, or acrylic paint. It’s best to use colors that contrast sharply with each other; however, for a more subtle look, use natural colors found in actual marble. Step 2. 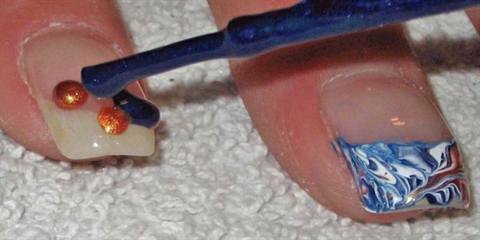 Apply your first color to the nail in several drops. Do not attempt to create a pattern. Step 3. Drop your second color in different places on the nail, filling in some of the blank spots. Step 4. Apply your third color in the same manner. Step 5. Drag your striper brush through the polish in any direction, a little or a lot. Step 6. To clean up your smile line, dip your brush in acetone then lightly dab it on a wipe or paper towel to remove any excess acetone. (Too much acetone will run into your design and ruin it.) Re-dip into acetone and dab as needed. Step 7. Allow the polish to dry, then apply a clear top coat to finish. I prefer to use a UV sealant so the polish or paint doesn’t wear away and the colors stay true. • Fingers must be done one at a time to ensure the polish/paint/gel does not dry before you’ve had a chance to marble it. For this reason, you have to work swiftly. For UV gel polish, flash cure after you have marbled all the colors on one finger, then move to the next finger. • A shortened striper brush works best. • To ensure variety, vary your placement of the colors between fingers and also vary the direction and the number of strokes. • Have fun! You can’t make a mistake.